Fusion hair extensions are fused to hair strands by a keratin protein bond tip using a safe heat application method. Stylists have been using the fusion hair extension application longer than any other. Christina White Salon installs more fusion extensions than any other extension type and more than any other salon in the Saint Louis area. Call us now for a free, no obligation quote at 314-380-4508. Unlike tape-in hair extensions, for example, fusion hair extensions come in strands of hair. With the tape-in method, wefts make the job easier and more effective, but with fusion extensions, individual strands of hair help to ensure that once the application is complete, the hair blends well and looks natural. How Many Fusion Extensions Do You Need for a Full Head? It depends on your goals for your hair. Fusion extensions come in packs of 20 or 25 strands each depending on the brand. Each of these strands has a small, flat, square-shaped tip that holds all the individual hairs together. A strand is made of around one gram of hair. A full head of hair is about five to nine packs of hair. This means you could have 100-180 hair extension strands, more or less, for a full head installation. While this may vary with other extension types, this is a generally good benchmark standard for hair amounts. How Long Do Fusion Extensions Last? Again, different brands of fusion extensions come in different sizes and levels of quality, but fusion hair can last for three to four months. 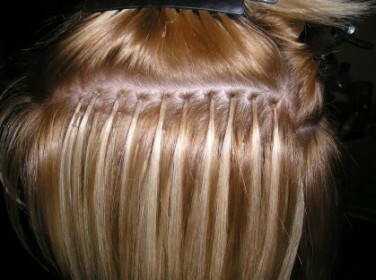 Although fusion hair extensions cost more up front, they need less maintenance than tape in hair extensions. All of Christina White Salon’s stylists are certified in fusion hair extension installation. We have experience in installing over 10 brands of fusion extensions. We even have our own brand of fusion hair extensions, Christina White. We also carry Hairdreams, SoCap, Aqua, and Donna Bella. We carry many different brands so we can correctly match the texture of your hair, color of your hair, length you want to achieve, and your price point. Why people love this method: They may take several hours to install, but they have extreme lasting hold. Keratin is a natural protein. It’s a strand by strand method, so there’s also a lot of styling potential.